Planning the Wedding: Stressful or Sacramental? For every engaged couple, the months of preparation leading up to the wedding are without a doubt laced with stressful moments. You’re constantly faced with major expenses coupled with an ever-shrinking budget. You have to manage both your own wishes for the wedding and societal and familial expectations, not to mention that you both still have lives that must go on in the meantime. It is no wonder that it is so easy to become overwhelmed when planning a wedding, and who would blame you with everything that is going on? Simply put, planning a wedding is hard. I think that people don’t blame you for being overwhelmed when planning a wedding because they expect you to be! There is such a strong societal expectation for a wedding to be stressful, that we are almost predisposed to dread it rather than enjoy it. As a young man, being engaged brings with it a certain stigma in which everyone seems to feel bad for me (this may in part be because of the misleading stigma that women are supposed to drive their fiances crazy during the planning process). Whenever my coworkers ask about how the wedding planning is going, they adopt a look in their eyes that makes it seem as though they are staring at an injured puppy. The most frequent follow-up question I get is, “How stressed are you?” or “How much more do you have to do?” Even one of my bosses took me aside for some advice on making it through an engagement. As a result of hearing these stereotypes on a daily basis, it was hard not to view what should be a potential opportunity for growth and excitement, as a stressful burden. At the beginning of our engagement, both real and preconceived stress did have its effect on us, individually and as a couple. We got into a few not-so-fun arguments over planning details and had many moments when it all seemed so overwhelming. For the most part, we wanted to merely skip ahead to the wedding day and forget about this entire planning process. Thankfully, it eventually hit us that we weren’t really focusing on the most important part about getting married: the sacrament. Being engaged is meant to be a special time of life that helps your relationship grow not only through challenges, but also through mutual love, preparation and prayer. As Catholics, we have felt the call to see our engagement as more than a time of logistical planning for a big party. While planning a meaningful celebration with our family and friends is important to us, it is more important that we plan for our life together as husband and wife during this time that is set aside for engagement. God can do wonderful things in the lives of a couple during the engagement period if they are open to it. From our experience, as soon as we started opening our hearts to what God was asking from us during this time, it became extremely evident that He wanted to pour grace into our lives and transform our hearts with His love through our preparation for marriage. With this focus on the Sacrament of Marriage at the forefront of our mind, the stress became much easier to handle. Since then, our minds aren’t always focused on a never ending to-do list and what more we “have to get done.” Instead, our minds and hearts are open to how much more God wants to do in us during this time of preparation. This isn’t to say that we have cast aside our to-do list or ignored the practical realities that come with planning a wedding, of course not. Rather, we bring this sacramental view with us into the logistical planning process and try to make all of our decisions reflect the glory of the sacrament. 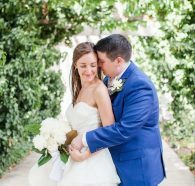 Moreover, while yes, wedding planning presents itself with a unique set of challenges and hardships, what better way to face hardship than with the person you’re planning on spending the rest of your life with? Each trial you face during your engagement has the power to help strengthen and prepare your relationship for the Sacrament of Marriage. Looking back on the last ten months since we became engaged, I can honestly say I would not change a thing. This is in no small amount due to how incredible Brooke has been throughout all of it. Obviously I already knew she had plenty of amazing qualities when I asked her to marry me, but even I was surprised at the fabulous job she has done planning our wedding. Her organizational skills, creativity and ability to balance a budget have reinforced how blessed I am to have her as my future wife and partner for life. It is through the process of focusing our preparation not only on the logistics but on the sacrament that our relationship has become stronger over the last ten months than I could have ever imagined. Next month Brooke will be sharing about some practical and prayerful ways we attempt to make preparing for the sacrament our top priority! Stay tuned.